SUPERHERO’S FRIEND: You mustn’t ever kill anyone. You can never come back from that. SUPERHERO: I’ve already killed someone. SUPERHERO’S FRIEND: Oh. Well – you can totally come back from that! Here are two facts that you’ll already know if you’re a Star Trek fan. But have you put the two together before? 1. “The Cage,” Gene Roddenberry’s original Star Trek pilot episode, featured a female first officer on the Enterprise, known only as Number One. The network, skittish about having both such a prominent female character and that demonic-looking alien named Spock, told Roddenberry he had to lose one or the other. Roddenberry chose to keep Spock and dump Number One. 2. 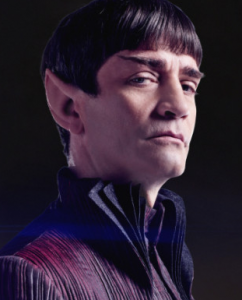 In “Lethe,” the sixth episode of the current series Star Trek: Discovery, Sarek learns that although both his half-human son Spock and his adopted human daughter Michael Burnham (who will later be first officer on the Shenzou) have qualified for the Vulcan Expeditionary Force, the leaders of the VEF are leery of Sarek’s “experiments” rearing “not-quite-Vulcans,” and so have decided that they will accept only one, not both. They leave the choice up to Sarek, who decides to let Spock rather than Michael get the post. I just now put these two facts together for the first time. I don’t think it’s a coincidence that twice someone is forced to choose between Spock and a female first officer, and chooses Spock. I feel pretty certain that the fictional choice in Discovery was a reference to Roddenberry’s real-life choice. I haven’t see anyone else comment on this.